Sometimes it’s fishing, sometimes it catching. People often ask me what I do for fun when I’m not cooking BBQ. One thing I enjoy when I have the time is off shore fishing here in So-Cal. Typically when I can swing the time off I will jump on a 1.5- 3 day trip out of San Diego. Our usual target fish is either yellowtail, dorado and either yellow or bluefin tuna. Some years we get albacore but the water temps have not been conducive to the species lately. For the last few years we have had spectacular bluefin fishing and since the commercial fleets got their limits early this year, our fishing has been phenomenal. 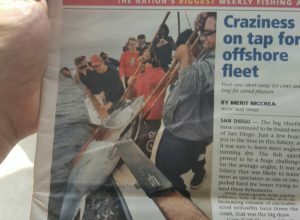 Earlier this year I lost a heartbreaker bluefin on light tackle after a four hour fight on a small skiff about 12 miles outside of Dana Point. Likely would have been my largest fish to date but since we didn’t land it then it doesn’t count. In July I had the opportunity to jump on a light load overnight trip out of San Diego on the Pacific Dawn. I boarded the boat around 9:00pm Friday night and got my tackle squared away. 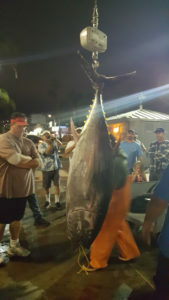 Once we were all signed in the captain announced that there was a great bluefin bite on the 43 bank. That’s a small high spot 43 miles west of San Diego. We took a vote and decided to try for bluefin. The catch with Bluefin is that they are big and extremely hard to land. Unless you have specific tackle your odds of hooking and landing one are slim. The other problem is that there were 17 people on the boat and we would likely hook and land 3-5 if we were lucky. We all agreed to share whatever we caught and the boat motored over to the bait receiver. No need to watch bait being loaded so I went below and crawled into my bunk. At 5:00am we were on the spot and we all climbed topside for coffee and wait for daylight. As soon as it was light enough to start trolling we deployed 2 kites so we could skip our baits on the surface. We took turns monitoring the trolling outfits and switched out every half hour. During the 2nd hour we hooked up on a big Bluefin. 1.5 hours later we gaffed and brought aboard a 238lb bluefin. Once the fish was spiked and bled and put on ice we started the rotation again. Within an hour we hooked another large fish. This one came to us a bit quicker and after an hour we had another large Bluefin on board. Kites back out and my number was called after 25 minutes of nothing the reel I was watching lit up as another Bluefin took the bait. I fought the fish for 45 minutes before passing the rod to another angler. A big fish can really work you over. The rod changed hands 4 more times until the fish came to gaff. We ended the trip with 4 fish 238, 228, 175, 165. 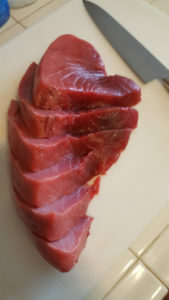 I took home two huge loins of perfect Bluefin tuna. Just for reference that’s a 10” blade on that knife. My photo even made the cover of the Western Outdoor News.